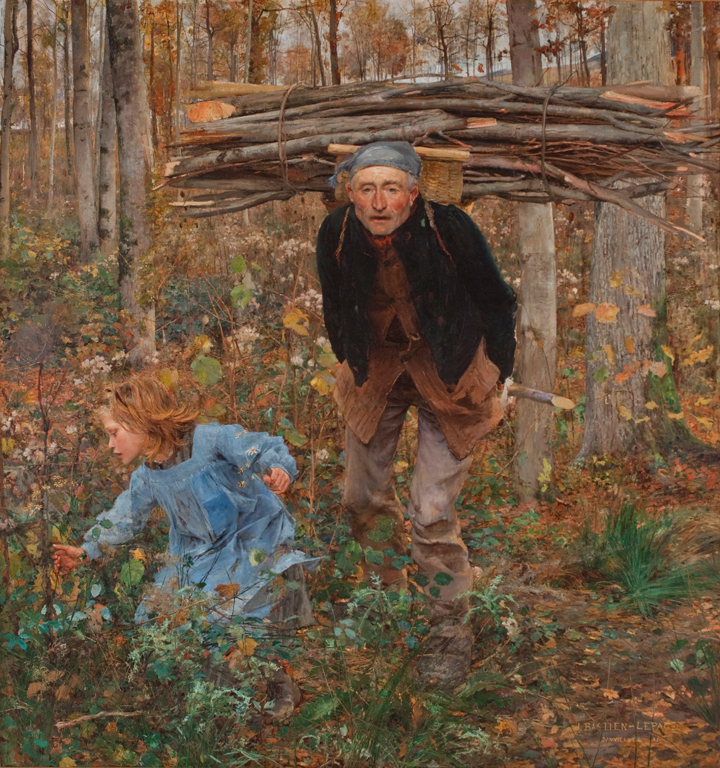 “Although it is no doubt owing to Millet that Lepage’s eyes were opened to the paintableness of country life, he saw his subjects in his own way and approached them from his own point of view….Lepage, on the contrary, appears to avoid communicating his mental impression. He will give you the visual impression, as truly as he possibly can; you may, if you please, find – as he has found – pathos and poetry in it: as before the same scene in nature, if you have sympathy; but for his part he will not help you by any comment of his own. And whereas with Millet the interest always centers in the subject, in Lepage it centers in the individual. His pictures become portraits. He chooses a good type, and sets himself to paint him at his work and amid his natural surroundings, and, somehow or other, the subject, as motive and reason for the picture, takes a subordinate place. And yet this is not because anything belonging to the subject is slurred, but because the attention is taken beyond the subject to the actors in it. For his figures not only live; they convince us of their identity as individuals, and gradually we get so interested in them that we begin to forget what they are doing, and almost to wonder why they are there. We are, in fact, brought so close to them that we cannot get away from the sense of their presence. It is not small tribute to Lepage’s skill that his people do so interest us; but is not this interest a conflicting element in the picture? Is it to the advantage of the picture that the interest should be so equally divided? I cannot tell: when before a picture of Lepage’s I accept it in everything – on thinking it over, I begin to doubt. There is no room for doubt about Millet; no mistake about what he meant. With him the attention is always concentrated on the business in hand: and without desiring to qualify the great respect and admiration which I have for Lepage’s work, it seems to me that the point of view of Millet included more essential truths (or perhaps excluded those which were not essential to the expression); and that for this reason Lepage’s most successful pictures depend least upon the interest of subject, and most upon the interest of portraiture." George Clausen, “Jules Bastien-Lepage as Artist,"in André Theuriet, Jules Bastien-Lepage and His Art. A Memoir (London: T. Fisher Unwin, 1892), pp. 116-18.